This is a guest post from Eric Holmstrom. (I wasn't able to find a full version of the song to post but you can listen to a sample here.) I had never heard this song before Eric emailed me. It now has an honored position on my playlist. Thanks Eric! And thanks to everyone who sends us great posting ideas. 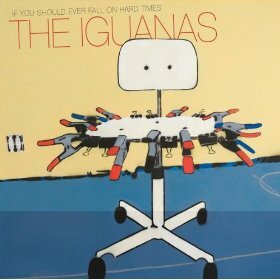 Rock/Swamp Rock/Americana/Chicano --- that's how ReverbNation categorizes the music of the Iguanas. They possess what is described as a "broad palette of styles ranging from crunchy, edgy rockers; funky soul strutters and succulent West Coast R & B to trad conjunto; dreamy cruisers and hard-boppin', conga-powered jazz supported by a myriad of Latin beats." All of this and more is on their last CD - If You Should Ever Fall On Hard Times. In the midst of its mélange of word and sounds the impressionistic Okemah stood out, catching the ear and interest of this history major and palliative care chaplain with images and impressions that led to a second listen and then, a third. Okemah? Choctaw overalls, sunset sounds? Cottonwoods, cotton mouth? Frozen hills of Chosin? That old robed Filipino? Smelling the old muddy creek, seven days a week. "Please release me, now, baby let me go." The medicine is kicking in, and I'm dreaming of chemo once again. Evocative and haunting, Hodge's words conjured up his father's time of dying. You hear his father's march on bloody frostbitten feet in the hills above the Chosin reservoir, living to live and then die another day. You see the Filipino, a veteran floor mate in that washed out faded robe on the VA oncology floor. You wonder where you do go when the meds kick in and chemo dreams take you down again? Where do you go when your father and your city is dying? Where do you go when all you can do is go with him? Okemah's haunting music and its lyrics are Rod Hughes' answer. dragging a twelve foot cotton sack. singing please release me, baby let me go. and I'm dreaming of old chemo once again. dreaming of, old chemo once again. Oklahoma sun, seven days a week. Choctaw overalls and sunset sounds. Okemah to Korea, they call it age of rock and roll. Children's Books on Grief: Where is Grandpa?